These are some of the more recent paint jobs I've done on commission for a customer. 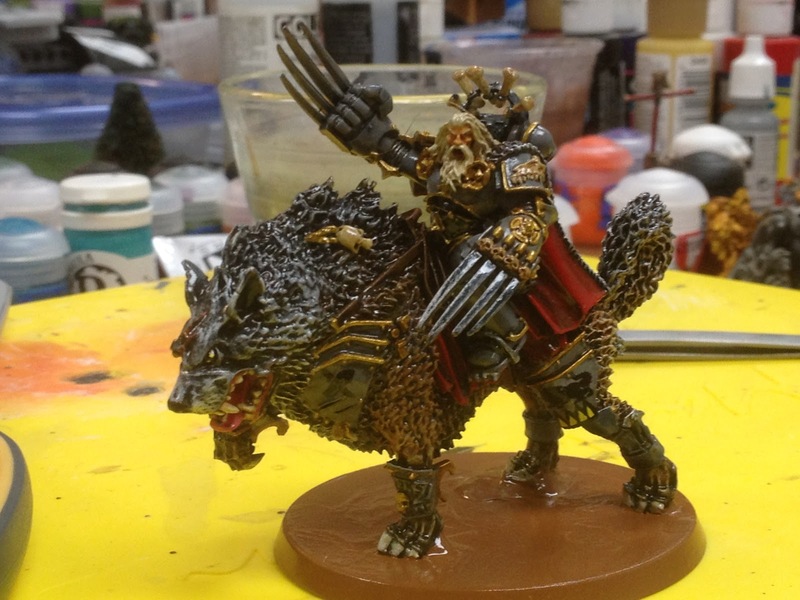 This is the Space Wolves character on a cyberwolf, whose name I forget because I don't play them. 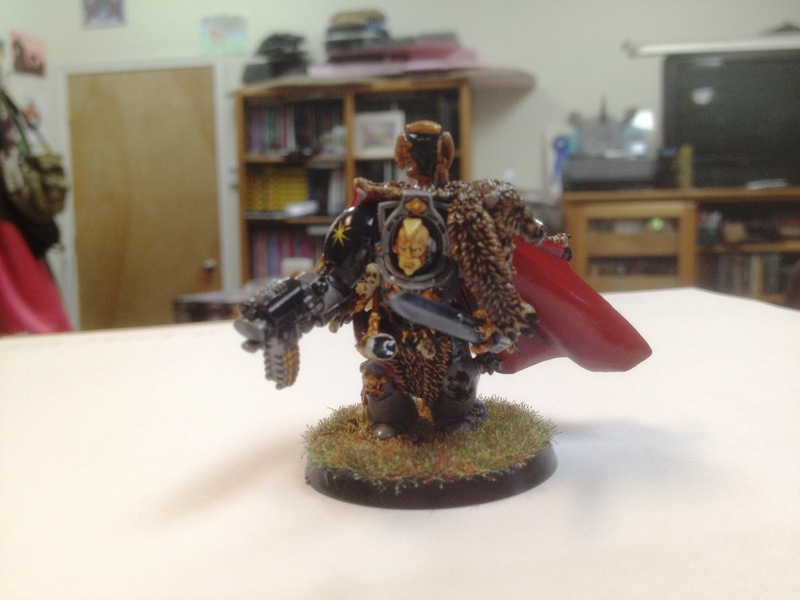 Base was left unfinished for the owner to complete to match the rest of his army. Below are three pictures of the most recent Space Wolf Terminator Sergeant I painted. The project took way longer to complete that I wanted, but I wasn't motivated as I don't like the Space Wolves, and never have liked them. However, when commissioned to paint something, you sometimes don't have a choice in what you paint. I like to be inspired because it makes the painting fun, here I had to make myself inspired to get the figure to look right and to get the colors to work with the figure. So, I hope you enjoy the photos, as the customer was pretty positive about the quality of the paint job. The right shoulder pad was a pain to get right for Logan Grimnar's heraldry, as they do not make a decal of the wolf rampant in white, only in black. So, I had to free hand paint the whole thing white on black, which wasn't easy or fun. However, it came out looking okay, and it is fairly close to the decal in black. 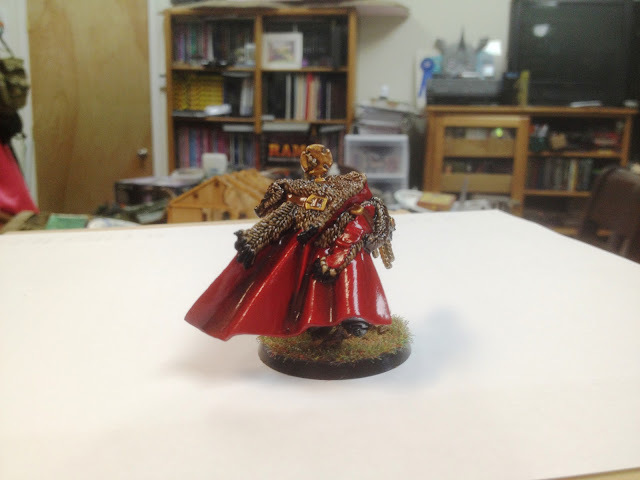 Here is the cloak from the rear view, lots of highlights, blending and shading, which came out alright as well. Perhaps not perfect, but pretty decent. Sorry for the gloss coating, but I do it to protect the paint job while the figure is in transit. 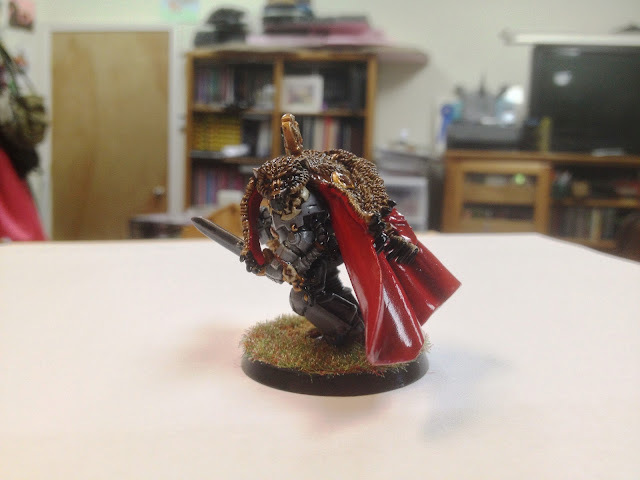 The other side view of the terminator sergeant, just a bit of highlighting and shading going on here, perhaps better in person than in the photo, but it works.